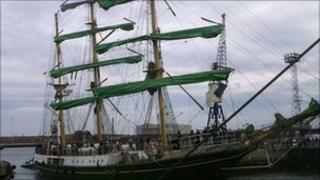 The Tall Ships event in Hartlepool generated £26.5m for the local economy, an independent report commissioned by the council has shown. It suggested that each visitor spent an average of £30.59 during the five-day event in August 2010. Visitors, local businesses, traders and exhibitors were among those asked for their opinions. The event, which cost £3.9m to host and left a council deficit of £720,000, has been described as "value for money". Hartlepool Mayor Stuart Drummond said: "Overall, I think this is a very positive report. "As a town we have to have ambition and be bold. "The event attracted almost one million visitors to Hartlepool from around the globe and this report shows that three quarters will be visiting the town again in the future."